Presenting Visual Art AND Live Music. Oil Paintings: Tracy Wallschlaeger; Light Sculptures: Bob Burstein; Piano/Violin Duo: Lesleigh Reinfried and Lauren Wilder. Tracy Wallschlaeger is a Seattle oil painter. Her work has been featured in community newspapers, Seattle Animal Shelter, Shoreline Community College and the First Avenue Women’s Shelter. Her poster design for The United Way’s Combined Fund Drive was selected as the prize winning entry for their annual fund raising efforts and her Spay and Neuter poster for Seattle Animal Shelter was selected as the national shelter poster prize winner for promoting animal care. Her influences include Edward Hopper, Georgia O’Keeffe and local artists Z.Z. Wei and Lois Silver. Bob Burstein: Fluid prisms – experimental work in polymers. Transparent, multicolored illuminated forms for your imagination. Wilder Reinfried Duo: Boasting a combined 36 years of musical experience, pianist Lesleigh Reinfried and violinist Lauren Wilder bring an inexhaustible charm and brilliance to their performance style. Individually, Wilder and Reinfried have performed at international venues and studied under world-class performers. As educators and performers, they showcase their versatility from the classroom to the concert hall, breathing life into repertoire from classical, to French tangos, to pop favorites, and everything in between. Artists present. Open only until 8pm. Collages by Thendara Kida-Gee utilizing 15 years of photographic dross. Inspired by much time spent in the natural world, returning back to the city and hermit away creating painterly canvases of texture and depth. The use of canvas satiating the painter deep inside. Artist present. Avanti Art & Design: NEW LOCATION! Monthly rotating art by local artists. 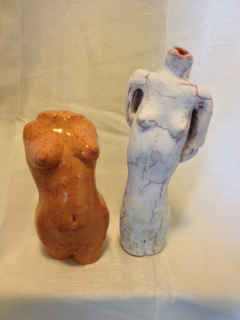 Not to be missed – Kathleen Dawe’s imaginative and fanciful collection of ceramic sculptures appeal to all. Her sensibilities wander from tongue in cheek social commentary such as vignettes of slug families going about their daily life (at Costco, for instance) to lovely functional bud vases in shapes of women’s body forms. This collection of 3D functional art and art for art’s sake is sure to delight you. Artist present. Southern Gothic presents the work of five female artists from Portland, whose works reveal a phantasmagoric world caught between fairytale and nightmare. Lea Barozzi, Lesley Reppetaux, Kalina Torino, Heidi Elise Wirz and Kendra Binney paint lissome, sloe-eyed beauties who journey unafraid through places steeped in myth, symbolism and danger. Fairytale imagery plays a key role in all of these fantastical visions. Lea Barozzi’s luminous gamines shine against a backdrop of twilit blue, their haunting eyes appearing to follow viewers from within the canvas. Painted in cool colors, Barozzi’s small vignettes contain mysterious iconography: sinuous striped tentacles, ghostly dark-eyed dogs, shy red fawns, and mounds of tiny skulls. Lesley Reppetaux’s acrylic on board paintings are scenes plucked from lost myths, rife with menacing creatures, spirit helpers, and not-so-innocent maidens who explore the wild in their skivvies. 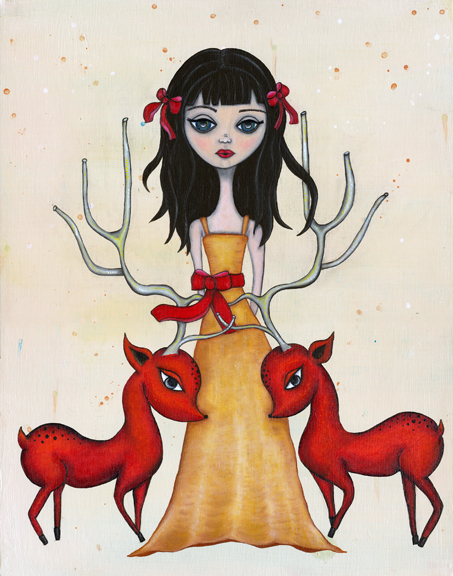 Rich jewel tones, a strong sense of humor and inspiration from world mythology mark the work of painter Kalina Torino. Whether they are pudgy mermaids, cutie-pie woodland nymphs, or tricksy sprites, Torino’s lively characters invite the viewer to enter a world bursting with mischief and play. *For the 3rd Year Bherd gallery is co-promoting their All Ladies show with TASTY gallery in our neighborhood, whose show is called: Tarts, Trollops & Tramps. 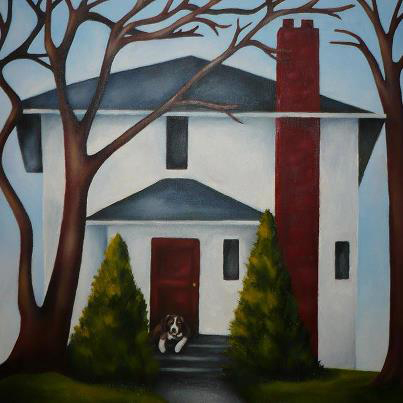 With 10% of all art sales donated to New Beginnings (a non-profit helping to end domestic violence). Featuring graphic artist, Ben Chamberlin. Artist present. A Margherita Pizza w/a glass of our Vino Della Casa for $15. Echo Echo Gallery’s artists are: Alexandria Sandlin, Christopher J Olson, Maxx, Mike Capp, Ripley, Xavier Lopez. Head down the stairs and follow the signs with the crown for another amazing show at Echo Echo. Artists present. Acrylic watercolor and ink on paper by Khalil Linane. 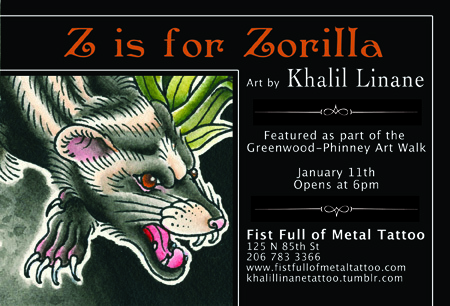 Khalil’s show presents to us the alphabet and animals to go along with it. Z is for Zorilla – Part II! Artist present. Painted motorcycle helmets and tanks by Tank & Helmet. Artist present. Water colors, acrylic & oil painting and fine art photography by Shayla Rasmussen, Jon Moore and Alexis Henry. 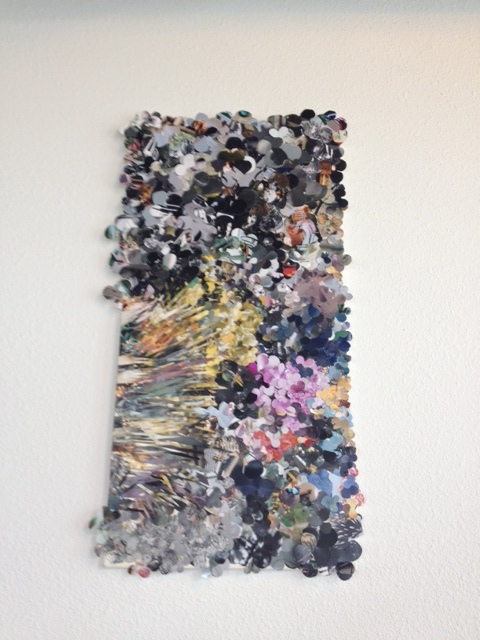 Featuring Devrim Ozkan: mono-printing meets oil painting meets mixed media meets love. Artist present. Black & white photography by Kim Hood. Artist present. Artwork by Oliver Braun (Age 9) and Bowie Neuwirth (Age 8). Featuring paintings and drawings inspired by life. Artists Present. 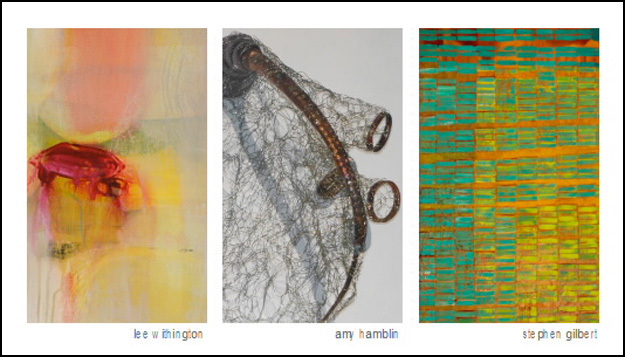 In February, the Phinney Center Gallery will showcase the work of local artists Stephen Gilbert, Amy Hamblin and Lee Withington in a show titled Between the Lines. Stephen Gilbert works with color, symmetry, shapes, visuals and mystical landmarks in his abstract acrylic paintings. Amy Hamblin creates large-scale sculptures and wearable art that are inspired by science and nature. Lee Withington’s paintings represent a desire to experience and resolve the apparent gap between accident and control, pain and pleasure, clarity and confusion. Artists present. Featuring colored pen and ink drawings and playable musical sculptures by Steve Einhorn. Artist present. Located across the street from the new Fred Meyer and above Mori Japanese Restaurant, The Studio of Awesome reopens this month for a Valentine’s Day Artist’s Trunk Show featuring a collection of local artisans offering wonderful hand crafted gifts for Valentine’s Day! 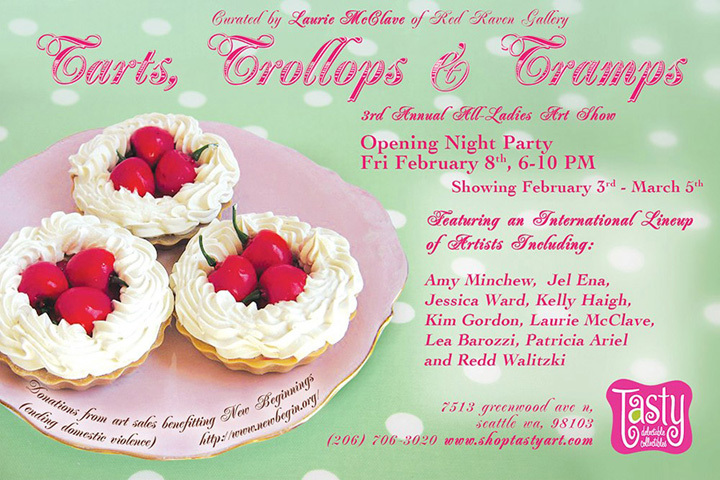 TARTS, TROLLOPS & TRAMPS runs FEB 3 – MAR 5 at Tasty curated by Laurie McClave of Red Raven Gallery featuring an international lineup of artists including the curator, with Amy Michew, Jel Ena, Jessica Ward, Kelly Haigh, Kim Gordon, Lea Barozzi, Patricia Ariel, Redd Walitzki and Amber Russell. Artists present. Javier S. Ortega was born in Seville Spain where he was trained in sculpture in the “Escuela de Artes Aplicadas” and ceramics in the “Escuela Taller Plaza España”. After this he traveled to Florence to continue his education. Upon completion, his time was divided between the cities of Seville, Valencia and the island of Menorca before deciding to move to the city of Seattle. Here he is continuing his career with successful exhibitions in some of the cafes and galleries scattered around said city. Illustration & comics-inspired drawings and paintings by Scott Faulkner, Dalton Webb and Tom Dougherty. Artists present. This entry was posted in Uncategorized and tagged Art Up Phinneywood, Greenwood Phinney Art Walk, Seattle Art by artupphinneywood. Bookmark the permalink.